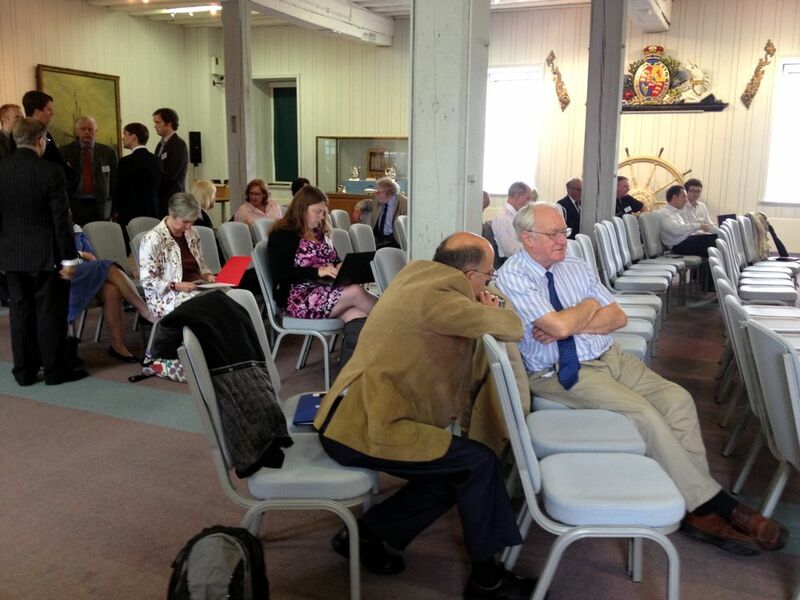 Last week Heather and I were delighted to be able to attend the Pressgangs, Conscripts and Professionals conference at the National Museum of the Royal Navy in Portsmouth, where we were invited to present a paper on the merchant service of two of the Indefatigable’s young gentlemen; Alex McVicar and John McKerie. …explore how the Royal Navy recruited its personnel from its earliest times to the present day, including its various branches and services. Duncan is to be congratulated for putting together an admirably diverse programme covering everything from the use of naval ballads as recruiting tools, to statistical analysis of Admiralty records, to contemporary naval recruitment, training and education. The quality of the papers was uniformly excellent and, despite a full programme, the panels never felt rushed, leaving plenty of time of time for lively debate and discussion. If there was a common theme running through the confernce it was the application of statistical analysis to archival records in order to provide a more accurate representation of data pertaining to manning the Royal Navy, and in many cases, the figures revealed were startling. Jeremiah Dancy’s research showed that at only 16%, the proportion of pressed men, as opposed to volunteers, was markedly lower than previously thought. While Evan Wilson’s analysis revealed that the officer class of the sailing navy was composed of fewer sons of the nobility, only about 3%, and many more young gentlemen from the professional and mercantile classes. Studies such as these are invaluable for broadening and deepening out understanding of the social make up of the Royal Navy and I know I am not alone in eagerly awaiting their publication. 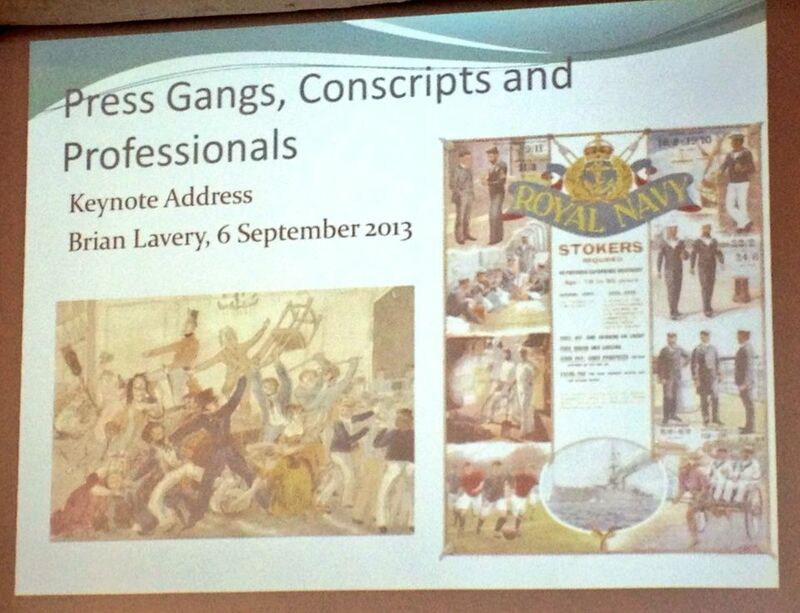 Without question the highlight of the conference was Brian Lavery’s keynote on the history of Royal Naval recruiting from the time of Chaucer’s seaman to the present day. In Clydeside they beat them up and in Edinburgh they sued them. Later in the 19th century engineer artificers brought trade union consciousness to the navy and the ideal seaman came to be described by Fisher as a cross between a Stoker and a Gunner. Moving into the 20th century, Lavery discussed perceptions of conscripted and volunteer naval recruits during the First World War, noting that the RN initially thought they would beat the Germans easily, partly because the German navy was conscripted, not like the British boys. However the two forces were much more evenly matched than the RN expected. 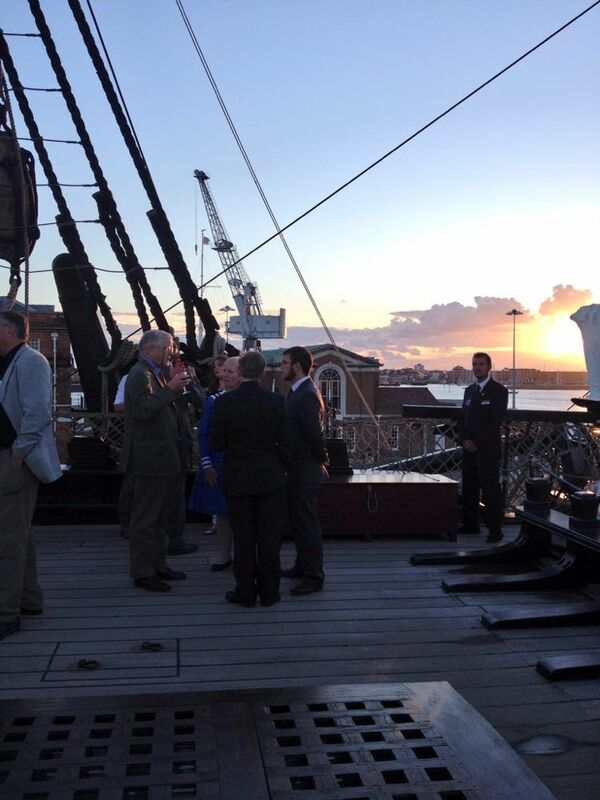 The other highlight of the conference was, of course, drinks and dinner aboard HMS Victory, which is always a memorable experience. Duncan and the NMRNP are to be congratulated on running an excellent conference of the very highest academic quality, and I’d also like to take this opportunity to thank the staff of the Museum who, as always, are unfailingly helpful and welcoming. I’ve written a short summary below of each paper based on my notes and tweets and there’s also a comprehensive Storify of all conference tweets here. Three paper focused on the Victorian Navy; Richard Blake, author of the highly recommended Evangelicals in the Royal Navy, spoke about the role of evangelicals in “converting Wild Jar Tar into Iconic Blue jacket”. Blake suggested that the contemporary perception of Jack Tar was that it was his drinking, carousing and immorality that made him a formidable fighter; to temper this would be to emasculate him. However this perception changed as “diseases of immorality” increased, and arctic expeditions tested out radical notions of piety and new ways of maintaining discipline. Ultimately, Blake argued, it was dockside evangelists rather than pious Admirals like Gambier which were more successful in taming Jack Tar. 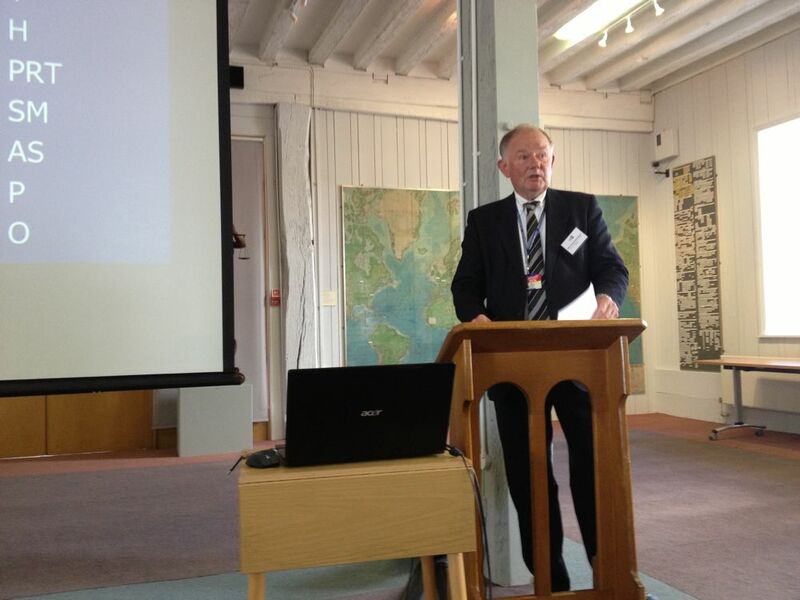 David Sheppard of the University of Wolverhapmton presented a paper on the profile of the men of the Victorian navy based on a detailed analysis of the 1881 census and the records of 226 ships in commission at the time. Virginia Preston and Oliver Watson of King’s College London and University of Duisberg Essen also presented an analysis of Victorian naval records covering 23 ships and over 4,000 sailors. Walton focused on the increasingly important role of stokers in the Royal Navy as sail power was replaced by steam. By the end of the 19th century seamen made up less than half of the navy, but stokers were not all low skilled shovellers, those grading coal and maintaining furnace temperature were much more highly skilled. Two panels covered the broad topic of recruitment, culture and identity. James Davey of the National Maritime Museum presented a paper on “Singing for the Nation: Balladry, naval recruitment and the language of patriotism in 18th century Britain”, which, for me, was one of high points of the conference. Ballads used patriotic tropes to encourage volunteers, they created a binary view of the patriotic man and the fearful coward, A pronounced similarity can be observed between the overwhelmingly positive and patriotic language of ballads, and that of naval recruiting posters, such as Cochrane’s famous Flying Pallas poster. The government even went as far as employing balladeers such as Dibdin who wrote positively about the navy. Jennifer Daley, of King’s College London spoke about the use of uniform as a recruiting tool during the Seven Years War. Uniform and clothing were used not just as a recruiting tool but also as a mechanism of social cohesion. The Marine Society used its own brand of sailor uniform as a recruiting tool to create a new identity for incoming landsmen and customised sailor uniform became a representation of sailors’ independent spirit, in contrast to their military peers. Daley’s paper sparked a lengthy debate about uniform and uniformity with Nicholas Rodger suggesting that it is inappropriate to talk of sailor uniform prior to the ADmiralty’s introduction of uniform regulations in 1857, and Daley arguing that as there was already uniformity before this act, the use of the term uniform is still valid. Later in the day Brian Lavery picked up this theme again, suggesting that while there was uniformity before 1857, there was uniform after it. In J. David Davies, independent scholar and author of Britannia’s Dragon: A Naval History of Wales, gave a highly entertaining presentation (peppered with terrible puns) that questioned the stereotypical view of Welsh sailors being press ganged by alien English imperialists. Though the brutality of the press and resistance to it is very much part of the Welsh folk memory, the majority of Welsh recruits were in fact volunteers. Proportionally more Welsh served at Trafalgar than Scots and Irish, and there was a particular regard for the navy in Wales during the latter half of the 18th century. I was particularly interested to learn that several of the original founders of the Eisteddfodau had originally been Royal Naval chaplains and clerks. Andrea Ellner, of Kings College London, focused on recruitment into the Wrens. Due to the popularity of the service there was no need for conscription; the RN expected 1,500 applicants for the Wrens in 1939, and received 15,000. The importance of the uniform and the tricorn hat to Wrens recruitment can not be underestimated; blue was regarded as “more becoming” than khaki. Recruitment was driven by educated middle class women, but the women joining the service had a wide range of social backgrounds. All women joined as ratings, regardless of class, and the experience proved to be an eye opener for many middle class girls. Claire Phelan, University of Mary Hardin-Baylor, gave a spirited paper on British impressment of American seamen and provided some splendid examples of arrogant attitudes and inflammatory language used on both sides of the Atlantic. American masters complained British officers “wield Jove’s thunder when impressing our men”. The Americans believed Britain acted with total disregard for other nations, while the British accused the Americans of wilful duplicity in the matter of protections. 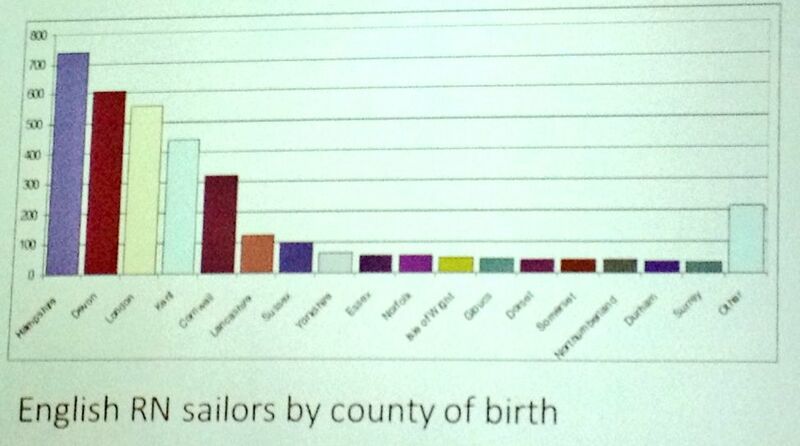 The exact number of British seamen serving in the US navy is unknown, but figure was as high as 60% on some ships. Often it was left to frequently illiterate women to campaign for the release of their impressed men. Jeremiah Dancy, Sam Houston State University, exploded the myth of the press gang by constructing a database to study British naval recruiting during Napoleonic war. Dancy’s research revealed that that only 16% of men were pressed while over 70% were volunteers. Many recruits were highly skilled men who were no strangers to the sea and already had experience from coastal vessels. Motivation for volunteering was complex; patriotism, adventure, opportunity and prospects of betterment were powerful motivators, as were tobacco, food and rum. Dancy concluded by asserting that only anecdotal evidence has been presented for large scale impressment of landsmen. Joshua Newton, National Maritime Museum, spoke about naval recruitment from slave ships and West African forts from 1750 -1750. Service in the navy could be a springboard to a merchant career in Africa, but conditions were tough. Abolitionists such as Clarkson claimed that far from being the nursery of the navy, the slave trade was actually the sailors’ graveyard. I had the pleasure of chairing this panel and I hope it wasn’t too obvious that I know next to nothing about the 20th century navy! Mike Farquharson-Roberts, University of Exeter, presented a paper about “The Specialists: Internal Recruiting in the RN” and suggested that specialists evolved by a process of accretion and chance. He also noted that, while there was no shortage of volunteer pilots, the navy struggled to recruit officers to become observers. Grove noted that the regional profile of young officers is interesting; many are from the Celtic Fringe and coastal regions, with few from metropolitan areas. Despite being threatened with closure since 1960, and suffering from a lack of long term planning, Dartmouth is still going strong and will continue to produce excellent product. Recollect that you must be a seaman to be an officer and also, that you can not be a good officer without being a gentleman. Despite Jervis famous complaint about the “vast overflow of young nobility” into the service, Wilson found that figures for the sons of nobility entering the service were much lower that suggested by Michael Lewis. Lewis put the figure at around 12%, however Wilson’s research shows that the figure is closer to 3%, with many more men than previously estimated coming from the business and commercial classes. Wilson’s full presentation can be viewed online here. Our own paper, which you can find here, focused on the recruitment and subsequent naval careers of Alex McVicar and John McKerlie, who served together as junior officers aboard the Indefatigable in the late 1790s. As merchant recruits, McVicar and McKerlie are far from unique, however their entry into the navy from the merchant service, and their subsequent careers, are particularly illustrative of this route to Royal naval command. Their formative years aboard the Indefatigable also highlight how an astute captain could make good use of skilled and versatile seamen recruited from the merchant service, while rewarding their experience by lobbying the Admiralty for promotion on their behalf. The final paper of the conference was by Don Bittner of the Marine Corps University who presented us with a history of the leaders of the Royal Marine Corps from 1755 – 1952. In a wide ranging and comprehensive presentation Bittner referred to the importance of films such as The Kaine Mutiny in shaping the reality and perception if the navy. Bittner also related the entertaining story of Sir John Boscawen Savage who was courtmartialed at the age of 60 following a duel resulting from him bringing his dog Bingo into the mess!